A local all-girl troop joined an all-boy troop to help on an Eagle Scout project Saturday in Tualatin. TUALATIN, Ore. — For the first time in its more than 100-year history the Boy Scouts of America is open to young women as well as young men. The move has received some pushback, but at an Eagle Scout project site in Tualatin, local kids were more wrapped up in teamwork. 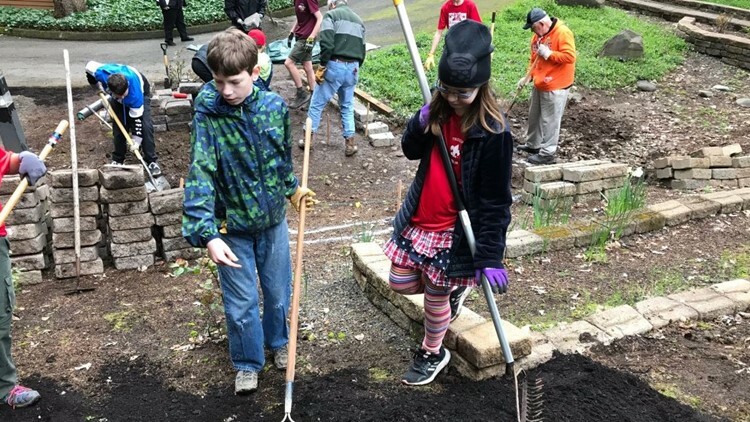 On Saturday, a group of kids from Tigard decided to wake up early and swap out their cartoons and video games for shovels and gardening gloves. They came together to build a memorial garden at Tualatin Presbyterian Church, as part of 14-year-old Drew MacHaffie's Eagle Scout project. "I said I was interested in it and the rest is history,” MacHaffie said. He enlisted the help of some new scouts: girls from Troop 797, who would not have had this opportunity just a few short months ago. In February, the Boy Scouts of America officially changed its long-standing rule of “boys only” and invited girls to join the ranks with their own troops. The organization also officially changed its name to Scouts BSA. In Scouts BSA, troops can be all-boy or all-girl. They may also be “linked,” which Troops 799 (boys) and 797 (girls) are. This allows them to work together while still being separate. “I think bringing it together is good for both troops,” said Kaitlyn Crowley of Troop 797. Like many of the girls in her troop, Crowley said she watched her brother learn survival skills, help his community and thrive in the program. She wanted in and started forming the troop with her mom in November. “It’s those kinds of experiences that kind of make me who I am, and I think that's what you get out of being in scouts,” she said. The same goes for 11-year-old Emilia Tapia, who first joined as a Cub Scout. “When they opened up the opportunity I wanted to so bad, I begged my mom and told her to sign up,” Tapia said. The change from BSA not only gave girls the green light to start their own troops, but also, to strive for the coveted role of Eagle Scout. The title is often a gateway for scholarships and a bright spot on college and job applications. It takes most scouts years to accomplish the feat of Eagle Scout. As 16-year-old Crowley knows, she is working against time but she is up for the challenge. “Eagle Scout isn't just a title. It's more of a journey and it kind of describes how much work you've put into learning all of this stuff,” she said. The decision by BSA to bring girls into scouting has drawn some criticism, but these local scouts are not getting wrapped up in those conversations. Instead they're focused on which merit badge they will acquire next. “I really want to be an Eagle Scout one day and that's what I'm really looking forward to. I know I'm just 11, but I know I can do big things,” Tapia said. To learn more about Scouts BSA or to find a troop near you, click here.